Urban blight can spread throughout a neighborhood and then down the street to the next. While economics may be the chief cause of urban blight, the visual effects such as boarded up windows, weeds, and overgrown foliage, only serve to exacerbate the problem. Now the city of Las Vegas is experimenting with a way to keep vacant buildings secure without the stigma of boarded-up windows. Communities spend a lot of time and money trying to curb urban blight. Code enforcement officers watch for buildings that have fallen into disrepair or abandoned. In most cases the owners of the properties are sent letters and asked to correct code violations. In some cases, the city has no other choice but to board up the building to prevent squatters from moving in or illegal activity from happening behind the walls. However, it is the boarded up building that signifies that the neighborhood is suffering. To help diminish the visual effects of urban blight, the City of Las Vegas is experimenting SecureView. 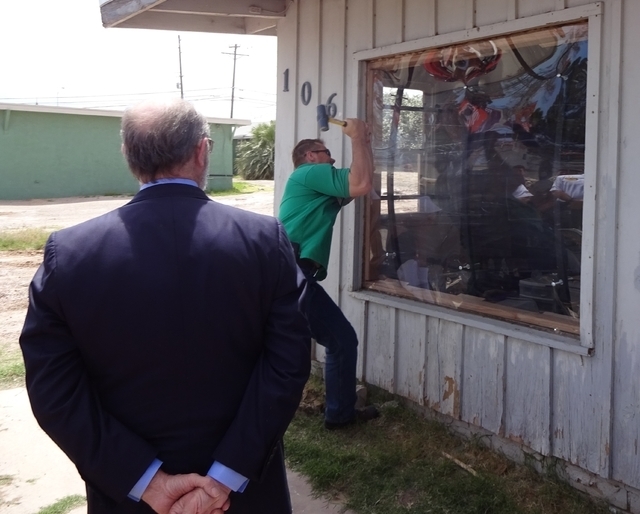 During a May 5 demonstration at an abandoned home near Charleston and Pecos, a team from SecureView replaced the unsightly plywood that the city had used to keep out vagrants, with a quarter-inch thick piece of recycled polycarbonate that is nearly as clear as glass and 200 times stronger. The idea behind the SecureView product came from Robert Klein, founder, and chairman of the company. Klein, a real estate investor, was a partner in a downtown Chicago property that was all boarded up to prevent further damage to the building before it could be sold. However, despite marketing efforts, the building was too unsightly to sell. “One of my partners is an engineer and suggested that we replaced the boards with a clear polycarbonate that looked like windows, and the building sold,” said Klein. The key to the product’s success is making a house, apartment, or commercial storefront look like the other buildings in the neighborhood, yet secure from squatters and vandals. Without the stigma of boarded up buildings, neighborhood property values don’t decline as much. And, by using a clear product, neighbors, security patrols, and first responders can see inside the building to make sure it remains vacant. Besides being clear, the polycarbonate is 200 times stronger than glass, so rocks and tools cannot be used to penetrate the surface. To prove the strength of the polycarbonate, volunteers were invited to try to break through the SecureView-covered opening using a sledgehammer. John Egan, a tall, muscular code enforcement officer with the City of Las Vegas, gave several mighty blows to the polycarbonate material. While the sound from each blow echoed louder than a gunshot and brought neighbors out of their homes, Egan only managed to make a few dents in the material. The clear polycarbonate sheets are cut using a diamond-edge circular saw blade and fit into the existing window frame. A metal backing arm is secured to the inside of the building and bolts are used to secure the polycarbonate material to the backing arms, creating a compression fit that cannot be penetrated. The SecureView product is sold in eight-foot lengths and widths of four-feet for $115, a five-foot width for $169, or a six-foot width for $199. Those costs also include the metal backing arms. For window openings that are larger than eight- by six-foot opening, such as a storefront window, SecureView can, for an additional charge, heat the edges of two panels to over 500 degrees and melt them together to form a single larger panel. If an abandoned building is demolished or refurbished, the SecureView system can be removed and reused many times over at other properties, saving even more money for the city of Las Vegas.